24 Hour Locksmith: Should You Replace Your Key Fob? Should You Replace Your Key Fob? These days, many new cars have key fobs. For those who aren’t familiar with key fobs, a key fob is a small device that has built-in technology that controls and secures access to certain items such as cars or computer systems. Key fobs help to control keyless entry systems since it’s essentially a remote. However, it can also be used with cars that do have keyholes. It depends on the model of the car you have, but the bottom line is that key fobs make your life easier and help to keep you safe. As great as key fobs are, sometimes they can become a little faulty. In today’s blog, we’re going to go over when you should replace your key fob. While you can always have it repaired, replacing a key fob can sometimes be the best option to ensure that you don’t get locked out of your car. If you do find yourself locked out of your car, then contact Pro-Lock & Safe. One of the areas that we focus on at Pro-Lock & Safe is automotive locksmith. Our 24 hour locksmith will be there in a jiffy no matter the time or where you are located in the Felton, DE, area. When To Replace Your Key Fob? So how do you know that it’s time to replace your key fob? 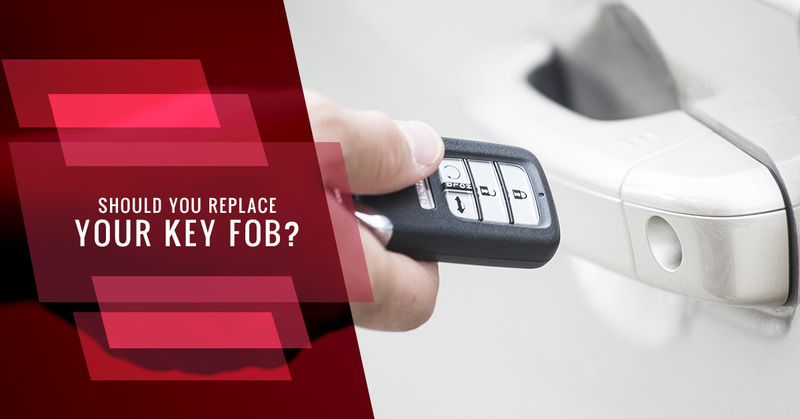 What should the key fob be doing to let you know that it needs to be replaced? As a 24 hour locksmith that specializes in automotive, we know how difficult it can be when you can’t get into your car. If your key fob isn’t working after a long day at work or after a morning of running errands, then we can help. Pro-Lock & Safe can help you get back on the road and we’ll also provide you with a free estimate, so you know exactly what you’re going to be paying. To help you know when to replace your key fob to avoid getting locked out of your car, we laid out some signs that you should look out for to know when it’s time to purchase a new key fob. If you start to notice that there’s a reduced signal strength, then it’s time to look into replacing your key fob. A key fob should be able to unlock or lock your car from up to 50 feet away. When you’re walking away from or to your car, SUV, or truck, you should be able to unlock or lock the door without having to press the key fob a few different times. As you approach, you’ll want to hear the clicking of your locks and vice versa when you leave. If you don’t notice those clicking sounds or your car light up, then it could be a sign that the battery is wearing down. A key fob should be working strong up to 50 feet away, but when you’re within range and you press the key fob and it doesn’t work, then it is time to replace the battery or purchase a new one. Take notice with the key fob when you try to start, unlock, or lock your door if you think it’s time for a new one. Another sign is that there is no consistency with your key fob. A key fob should work consistently. After all, you press the button and then it locks, unlocks, or it starts. However, if you noticed that the key fob isn’t working consistently, then it could be time to purchase a new one. A key fob’s functions can be inconsistent because the battery is wearing out. You’ll want to find a replacement battery for the key fob or purchase a brand new one to ensure that it works effectively and you can start, lock, or unlock your car. Lastly, if you have to press the button multiple times, then it’s best that you replace the key fob. By having to click multiple times to unlock the door, it’ll create a hassle for you and no one wants that, especially if you’re in a rush. If it takes you a lot of effort to unlock the car door, then it’s a sure sign that the battery is wearing out and needs to be replaced. Multiple clicks for a key fob to unlock your doors can also create an uneasy feeling in the pit of your stomach, so it’s best to address the issue as quickly as possible. Key fobs can be very finicky, so it’s best to have a 24 hour locksmith who you trust and can help if you get into a sticky situation.